Cc stands for carbon copy and it means that whoever name appears after the Cc: will get a copy of the message. People who receive the mail can see who else is getting the copy of the message. The Cc header would also appear inside the header of the received message. Bcc stands for blind carbon copy. 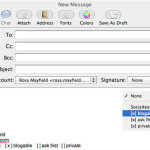 With Bcc the recipients specified in this field do not appear in the received message. So all the recipients will get the message but cannot see others’ name on the sent addresses. sharmila. "Difference Between Cc and Bcc." DifferenceBetween.net. May 7, 2009 < http://www.differencebetween.net/technology/199/ >.